No matter what kind of goal or program you’re working toward, it’s extremely important not only to set measurable goals, but to track your progress so you can see how far you’ve come and learn more about the choices that impact your success the most. You are your own best motivator! You have nothing to prove to anyone but yourself. At the moment I’m stoked on my progress and want to share that with anyone who’s reading! I started this blog around the same time that I started “dieting,” almost seven weeks ago, and since then I’ve greatly reduced my weekly calorie intake and have cut five meaningful pounds from my body weight (weight fluctuates – but 5lbs are definitely gone and not coming back!). My half marathon is coming up in August, still months to train, and I already feel much more prepared than I did on race day last year. I did this without entirely cutting bread or cheese from my diet! Or even donuts. Granted, I went from a million sweet treats per week to only about 1 or 2. And I actually didn’t workout any more than usual…probably less because I got super busy with work and other things. So to have lost weight for the first time in months, without actually putting time in at the gym, is pretty amazing and I think I can attribute that 100% to my nutrition. 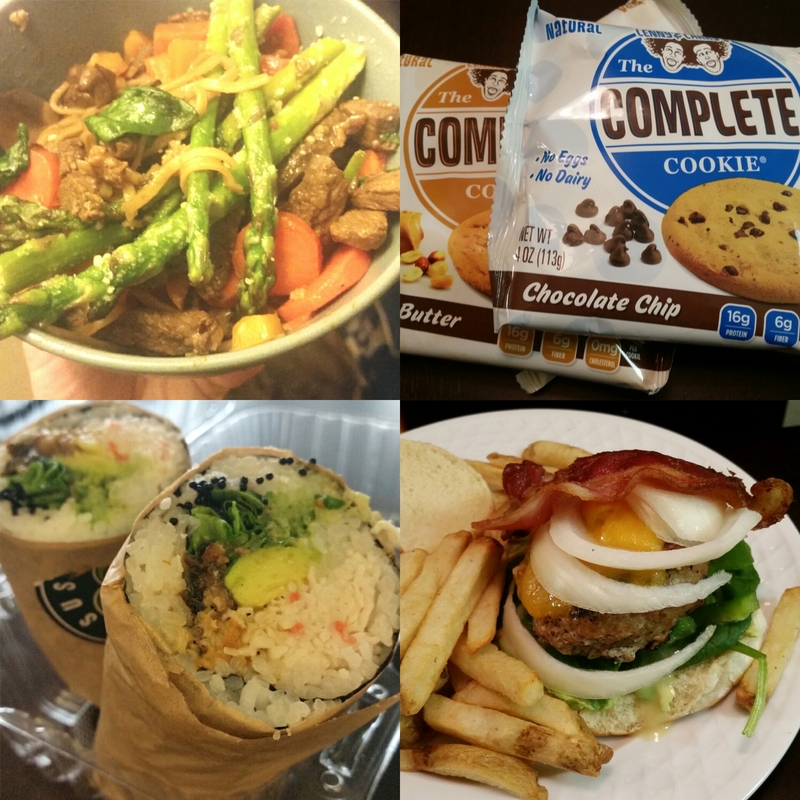 Just a few of the awesome things I put in my mouth lately – Homemade beef stir-fry noodles topped with asparagus, Lenny & Larry’s Complete Cookies, SushiFreak SushiBurrito (yes), and homemade turkey burger with bacon, cheddar, spinach and avocado. I’m most satisfied with how a slightly better diet is helping me manifest the body type I’ve already been working toward through exercise. I have a tall and athletic frame, and have never known the luxury of “skinny,” toned thighs – as a kid I always had serious leg muscles from constantly playing sports, and later as the Freshman 15 took hold they kind of just turned to blobs. Even after running for 2 years, I still had not seen an evolution in my leg shape and was concerned maybe I wasn’t building muscle there after all. But after just this short time really concentrating on my whole self through nutrition, the fat is coming off and I now have real quads to show off to the rest of the world. My strength in my stride and overall running form are improving every day I lace up my shoes, and the results are finally visible. I wish I could tell exactly what sparked this progress for me, but I can only speculate based on what I’ve observed. I really think it has to do with three key macros – carbs, protein, and sugars. When you start tracking your nutrition, you too will see where you are doing too much and what you’re deficient in. At first it seemed impossible to consume 80 grams of protein in a day – and really the suggestion for women training is 90 grams. My first week I only did 65 grams per day on average. However when I looked at my high carb and sugar intake, I figured that I’d really just been substituting treats and bread for the protein I should be eating. Easy problem to solve by finding a protein bar that you really like. PowerCrunch and Quest Bars/Chips are some of the best tasting products on the market – you can get your sweet fix without completely ruining your macros for the day. Pricey, but like most great things you can find some of their flavors on Vitacost for a bit of a discount. Since today is Sunday, I’m going to try and get ahead of myself by preparing some chicken stir fry with rice and veggies to eat for lunches this week. Still learning a lot about breakfast…anyone who preps breakfasts for the week, I am all ears because I have no clue what keeps well in the fridge or freezer that isn’t Cinnamon Toast Crunch & almond milk. I love my hemp shake but would love to switch things up with more hearty protein – eggs, sausage, etc.